Grappa is the most traditional Italian spirit, it derives from the agricultural culture of an Italian society that nowadays doesn’t exist anymore. But now grappa is making it to place itself in the club of worldwide premium spirits. Credits for this success go to those distilleries that understood the real potentialities of this grape’s byproduct and refined it matching tradition and innovation as only Italians are able to do. Among them the Bonollo family stands out; born in Veneto region, back in 1908 they turned the family passion for grappa making into a business and now the company is led by the fourth generation. The founder was Giuseppe Bonollo, real pioneer in the field of steam stills that allowed the production of kind of grappas characterized by better organoleptic qualities than traditional ones. Since than four family generations alternated and several technological innovations and changes in the way of perceiving grappa happened. And the process ain’t over yet. “It’s a never ending challenge – says Elvio Bonollo, in charge of the Bonollo Umberto Distilleries and the two facilities in Mestrino and Conselve (province of Padua) with his brothers Filippo and Emanuele, his father Bruno and his cousins Luigi and Giorgio – it’s a run to buy out the best pomaces and to treat them as fast as possible in order not to waste their aromatic potential; it’s a rush even if time and patience are key elements to refine the product and make it suitable for the tasting preferences of current customers”. Bonollo can exploit the advantage deriving from its location. The company’s headquarters are in the heart of an area that goes East-West from Venice to Verona and North-South from Conegliano to Este (South of the Colli Euganei). Then it includes all DOC areas in the Veneto region: from Valpolicella to Soave, from Conegliano all the way South to the Colli Euganei. There’s a great number of different pomace varieties: Cabernet, Chardonnay, Pinot Gris, Prosecco, up to premium ones as Amarone, Moscato Fior d’Arancio and Friulano. The common taste for grappa has changed during the last century. At the origin grappa was rough and strong. Nowadays the challenge for distilleries is to match the traditional intense flavor with smoothness and elegance in the character. A balance that only real master alchemists can obtain. It’s a continuous challenge lasting all year long: on September it’s a rush to buy out and pick up the pomaces from the best wineries. In a couple months they must be vacuum stocked and their fermentation be completed; then distillation processes start and are carried out through Spring. The period from June to September is the only available time window for setting up and modifying the distillation processes and the stills, because during the distillation period all stills are sealed by the Customs. The rest of the process is up to the Master distillers who work on the different kind of grappas, blending different grappas in order to obtain both varietally and blended grappas. extraction of the aromas. This is called Sistema Unico di Produzione Bonollo (Unique Production System of Bonollo): it’s a complex process that starts from the careful selection and early pick up of the pomace, goes through the flexible distillation (allowing the complete extraction of the aromatic potential of the pomace) and ends up with the creation of very modern kind of grappas that are elegant and smooth yet rich and flavorful on the palate. This is the result of technological innovations and experience acquired also through the takeover of oher small distilleries back in the 70s. Tradition and innovation, experience and technology: the outcome of this mix was the introduction of the “OF” grappa in 1999. “OF” as Of Bonollo, that means this grappa is the best expression of the family history. “We were thinking about a product for international markets – Elvio Bonollo recalls – but we found out soon that Italy was still coming first”. Of Amarone immediately matched not only the taste of North Italian consumers, but also the rest of Italy’s. In the Central and Southern Italy consumers welcomed grappa very openly and nicely, pretty surprisingly for a product category typically produced in Northern Italy. The choice of selling just to the HO.RE.CA channel and not through wholesalers really paid off: restaurants, wine shops, wine bars were able to make their customers taste and appreciate the product. Bonollo had to build a network of more than 150 representatives to optimize the distribution throughout the national territory. They also contributed to valorize the “OF” brand that along the years became a quality benchmark and created the product category of the grappa aged in barrique barrels. The packaging played an important role, too. It’s completed by hand on every bottle. The shape of the bottle ain’t cylindrical anymore as it was typical for grappa bottles, but turned into an originally designed bottle easily recognizable by customers. But packaging is useless whether not supported by the consistent quality of the inner content. This is the key point: it’s not possible to fix standard rules to be applied every year, every vintage the distillation process restarts in a new way because it must adapt to an alive raw material as pomace is. Then there’s not a unique rule or secret to guard, but there’s an approach to the product that has been passed through four generations, in addition to the knowledge of the raw material and the choice of the most suitable distillation process to extract the maximum aromatic potential from the pomace. 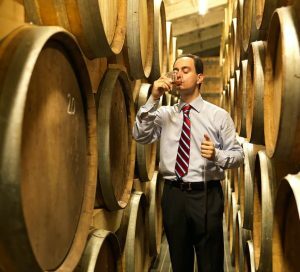 “OF” keeps growing in international markets, but Bonollo has already started a new challenge in the American market: to produce and sell the first grappa ever meant to be mixed in cocktails. It’s called Gra’it, that sounds like “great” but it’s simply the blend of the words “grappa” and “Italia”. This was possible because grappa doesn’t feel inferior to any other spirit category anymore: grappa has already reached the quality levels of whiskies, rums and brandies. And, as Bonollo demonstrated, can even win them.